If you’ve ever had the misfortune of getting into conversation with me, at some point I probably mentioned keyboards to you. I like keyboards a lot. It’s a weird, expensive hobby (why does anyone need to own more than one?) but, hey, keyboards make me happy. 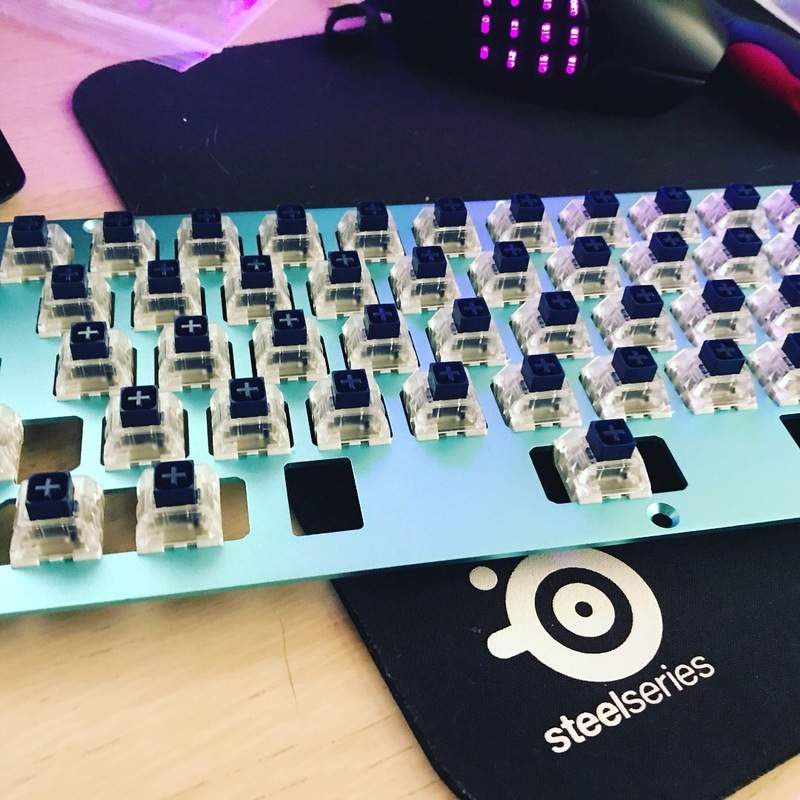 I also enjoy getting second degree burns over my most important fingers, which is why I’ve built my own custom keyboard. This post is picture-heavy, so if you live in 1995 you might want to unplug your phone. 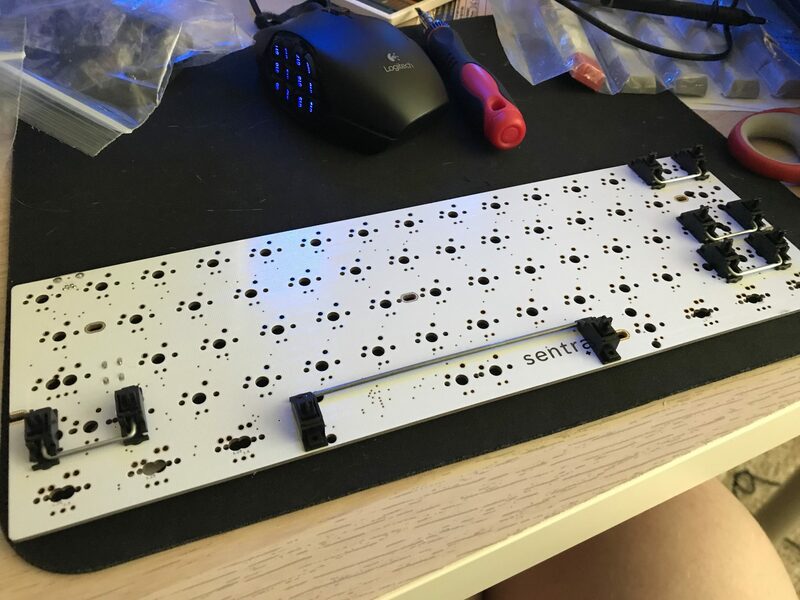 Sentraq kits are recommended for beginners so I ordered the S60-X kit. The kit’s great (and comes with everything you need! ), but I’m not sure if I would recommend ordering from Sentraq, as my kit took 3 months to ship and only did so after a couple weeks of prodding the site owner on reddit. Supposedly my experience is unusual, but I’m not sure I’d personally order from them again. Caveat emptor if you choose to follow in my footsteps. When my kit arrived I ended up swapping out the Gat Browns (what was I thinking?) and blank XDA keycaps that I picked out. 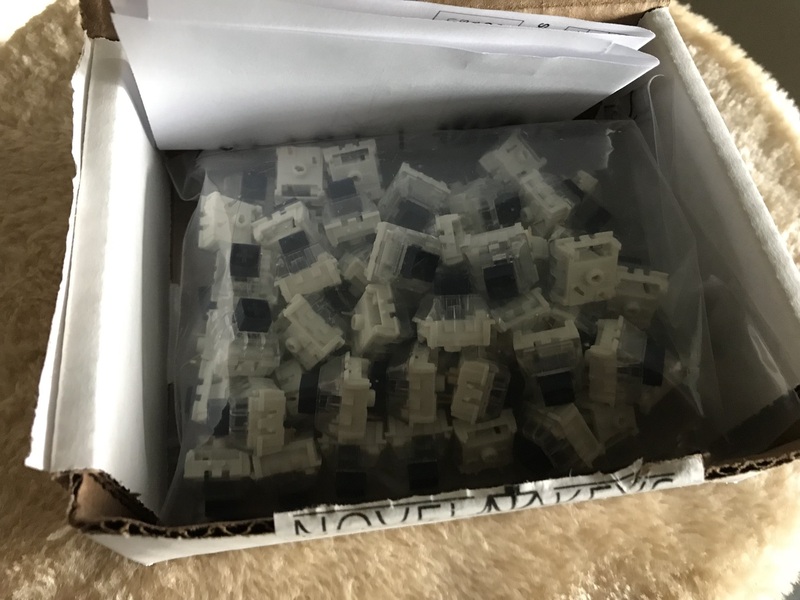 Instead I opted for Kailh BOX Navies, which just make the greatest sound ever. This isn’t going to be a quiet office board, but I’ve discovered that RGB underglow earns you weird looks in the workplace anyway. Snapping the switches into the plate is oddly therapeutic. 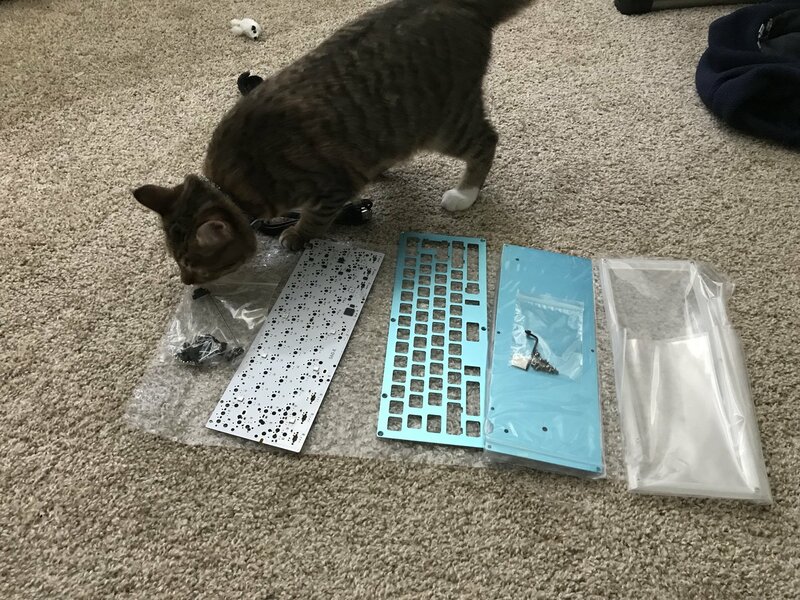 I chose a standard layout because it’s exhausting enough trying to find keycap sets for my Vortex Race 3. We’re here to look good. Also the S60-X PCB doesn’t support an arrow cluster so what’s even the point of going with a nonstandard layout? The TKL that I currently use as my daily driver uses Costar stabilizers, which only makes me appreciate how nice Cherry style ones are. I didn’t clip the stabs (mainly because I don’t own pliers or any similar tools) but I did lube them with whatever lube I had in my Big Box of Orphaned Keyboard Parts. 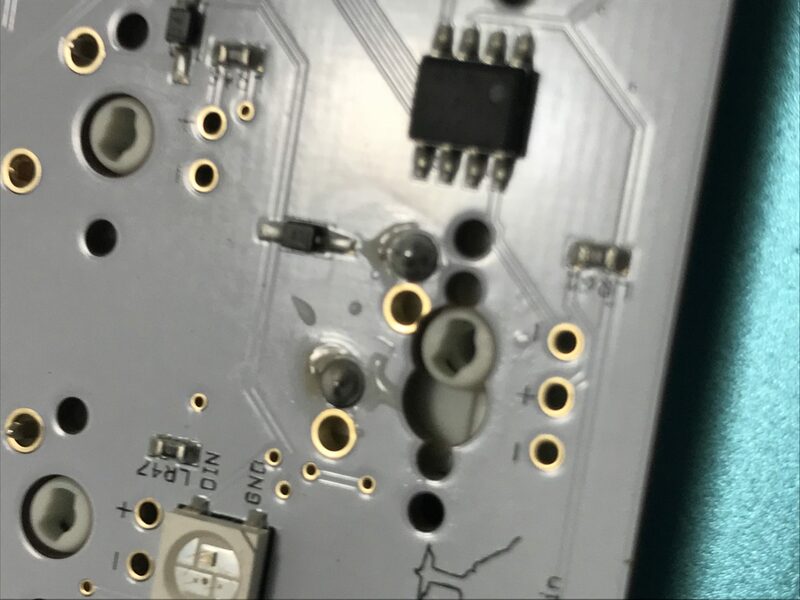 With all that done, and making sure the switch pins line up correctly with the through holes on the PCB, it’s time for the scary bit. 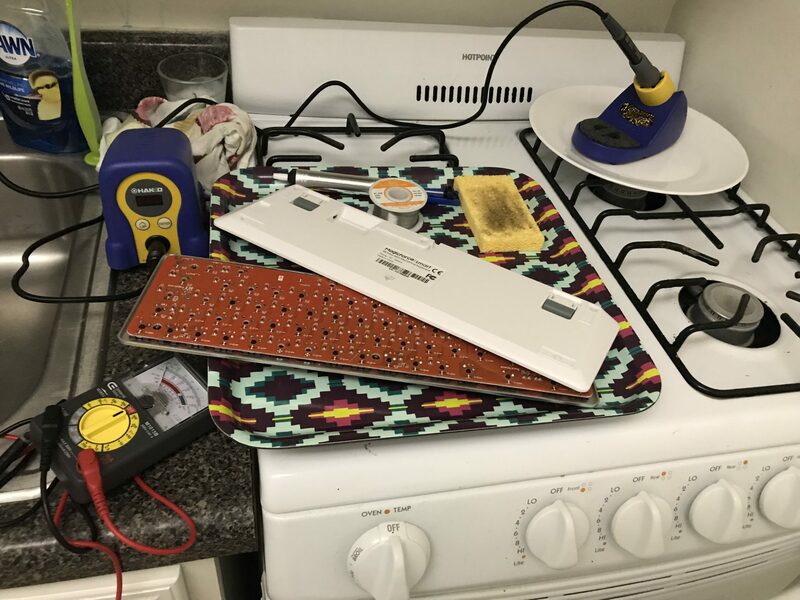 I don’t know how good a kitchen extractor hood is for getting rid of solder fumes, but the only other available workspace is directly under my apartment’s smoke detector so I turned my stove into an electronics workbench. 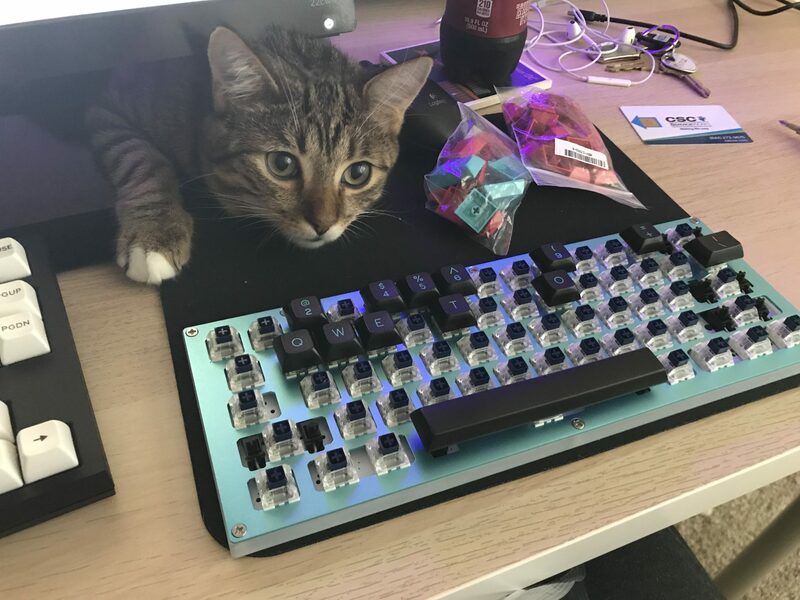 Pictured below with the poor Magicforce 68 I use to practice desoldering. My old, cheap iron burnt off more than one of the Magicforce’s pads. I’m not the best at getting those nice volcano-shaped fillets every time, but I like to think I did pretty well for a novice. That brownish stuff is just flux residue I swear. With every switch soldered in, I plugged the unfinished board in to quickly check that every switch was being registered. At some point I realized that I placed the Left Ctrl, Left OS and Caps Lock switches in slightly the wrong positions for the layout I was going for and had to de- and resolder them. 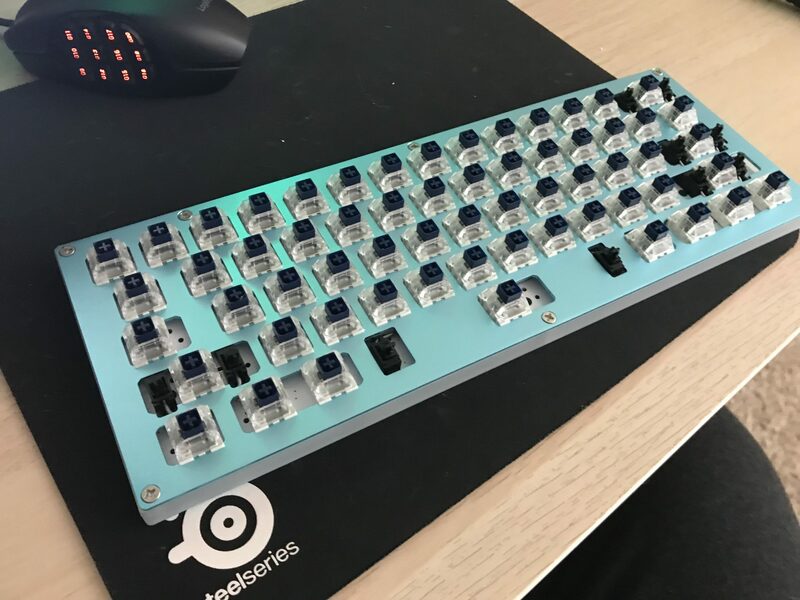 Good thing I had all that practice cannibalizing that poor Magicforce. 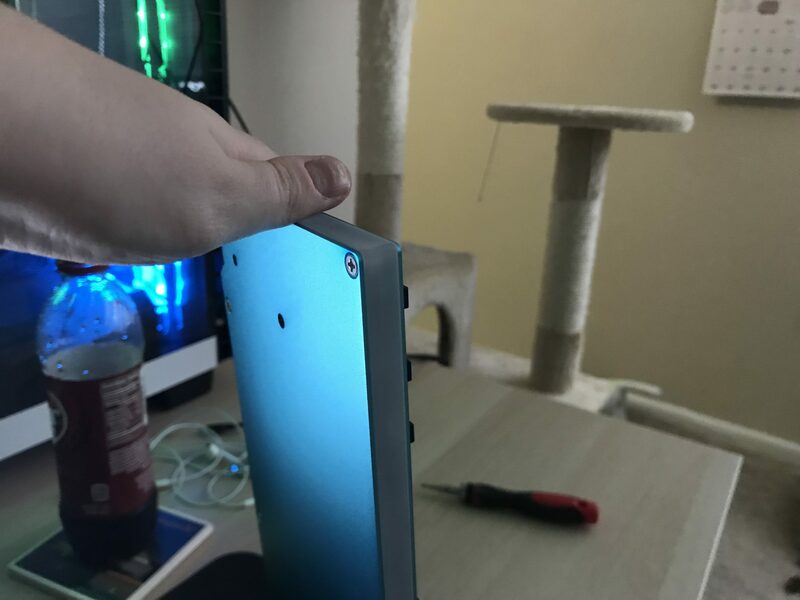 With switch seating mishaps out of the way, it’s time to assemble the rest of the case. I used to not like the look of sandwich cases. 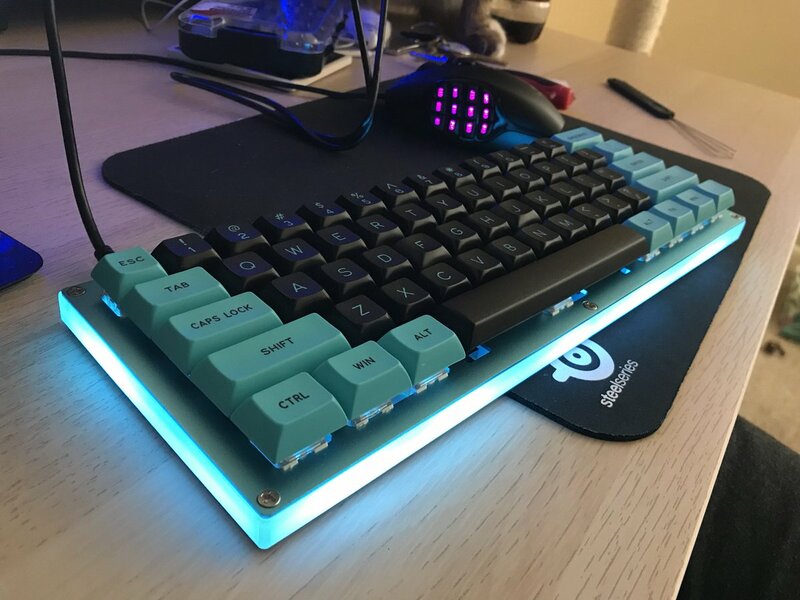 Only after seeing what some cases were doing with acrylic and underglow did they begin to grow on me. And now, keycaps. I joined the group buy for DSA Legacy way back in October or so and they only shipped at the end of May and by then I wasn’t really interested in my originally planned use for them. So they’ve sat in the Big Box of Orphaned Keyboard Parts for the last month. 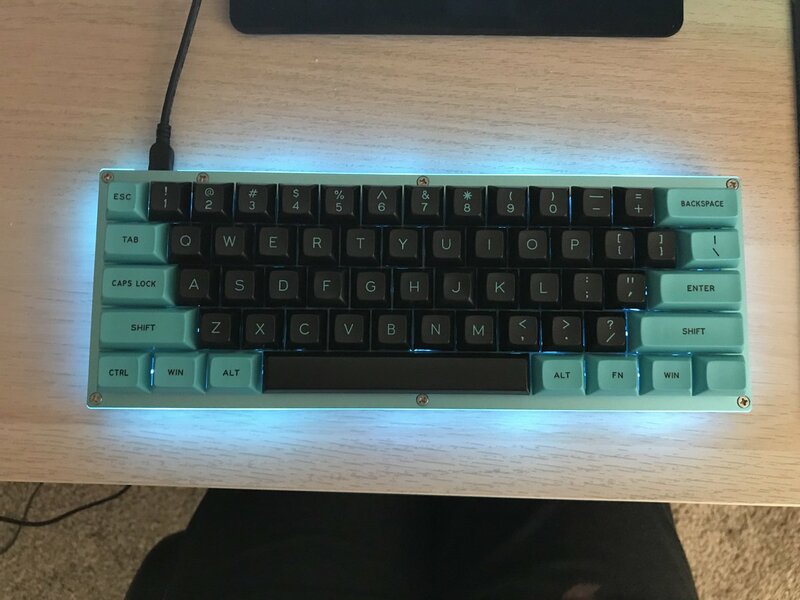 Fortunately, the black alphas and blue modifiers go great with my new board’s cyan plate. I also have the pink TKL set (I was originally going for something Miami-ish) but this is a 60% board, so TKL sets aren’t needed. My cat likes to be involved in things. Now all that’s left is to flash the firmware. This is boring and not very pretty so I’m not going to post any screenshots. Honestly the documentation for this PCB is pretty rough. There was already some firmware pre-programmed but it was just your standard 60% layers 0 and 1. 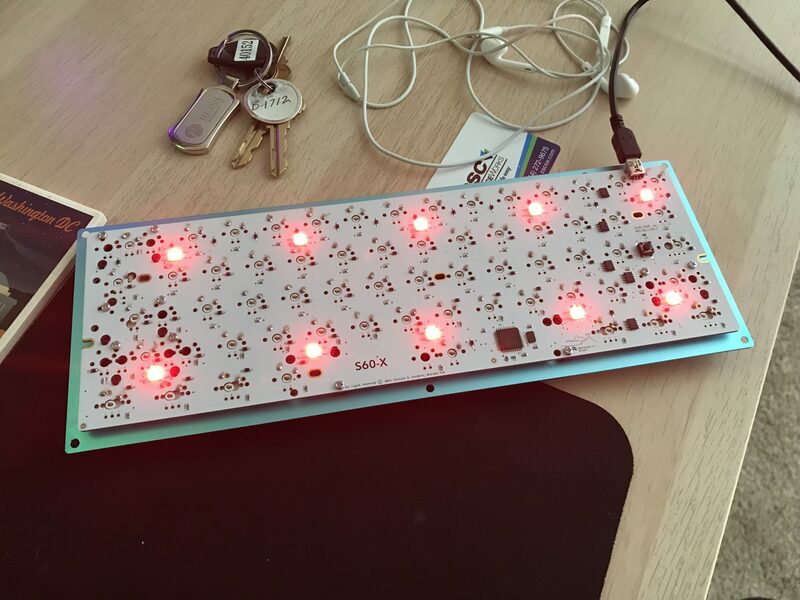 I couldn’t find any way to adjust the RGB without creating and flashing my own QMK build. There are a lot of tools and documentation out there for this, so it’s not particularly difficult.